And again Cartoon Network made us happy thanks to another interesting game where we can join Courage, the Cowardly Dog in his adventure. The summer vacation turned out to be a nightmare for Courage. His owners were trapped inside an ancient pyramid and Courage is the only one who can save them. 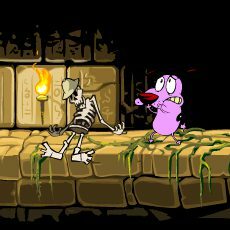 Fight off monsters and mummies along the way, do not get trapped yourself!